Whenever compression fittings are preferred, make sure your customers know about SmartCompression EMT with pre-installed compression coupling. UL-listed concrete-tight, SmartCompression EMT is designed to do the job with increased efficiency. The pre-installed coupling makes installation 67% faster than standard compression coupling installations. Plus, our proprietary ID coating makes wire pulling 20% faster than uncoated EMT. SmartCompression EMT is made in the USA and can be manufactured to raintight specifications upon request. Depend on Wheatland Tube to keep you stocked with the full range of electrical products, readily available from facilities near you. 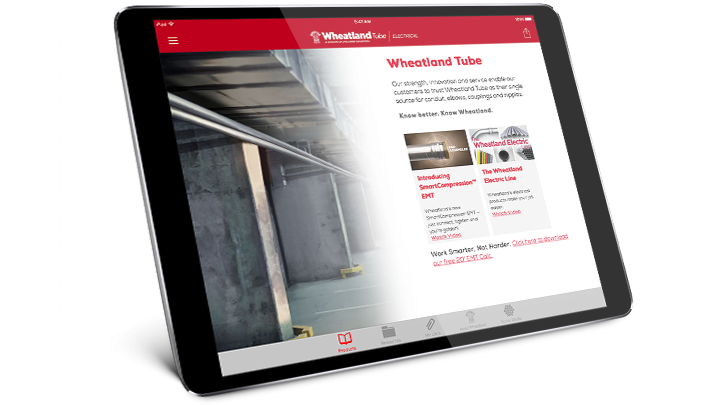 Available for the iPad, the Wheatland Electric app provides mobile users with access to the latest information about EMT, conduit, and EC&N products available from Wheatland Tube. It enables professionals in the electrical contracting and distribution industries to learn about Wheatland’s full line of products from their iPad device. See how we MAKE IT eZ for you to work with us to meet your customers' needs. Get complete details about SmartCompression EMT with pre-installed compression coupling. See all of our SmartCompression EMT resources.